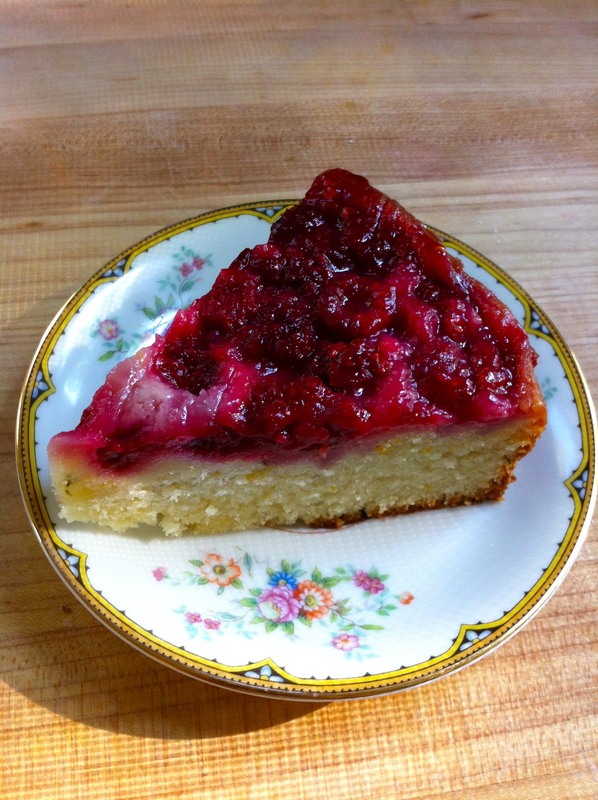 A friend of mine requested that I “do something with rhubarb” for one of my next blog posts. I asked her what I thought was a reasonable question, “What, do you mean like a cobbler or a crisp? Something like that?” By the look on her face, I knew I was way off. She wanted something different, something unusual and unexpected. Lucky for her, I didn’t want to make a cobbler or a crisp anyway. I wanted something different, as well. I also didn’t want to go to the store. I wanted to do something with my farmers market rhubarb that didn’t require leaving the house in weather more suited for the depths of hell. It’s hot here in Nebraska, folks. H-O-T. I didn’t want to go outside and I didn’t want to turn my oven up to 350 degrees. Fear and avoidance kept me in the house and forced me to be creative. I knew I had some tart cherries in the freezer left over from pie-making, so with giddy anticipation, I swung open the freezer, felt the icy air wash over me, and I searched for the loot. Eureka! 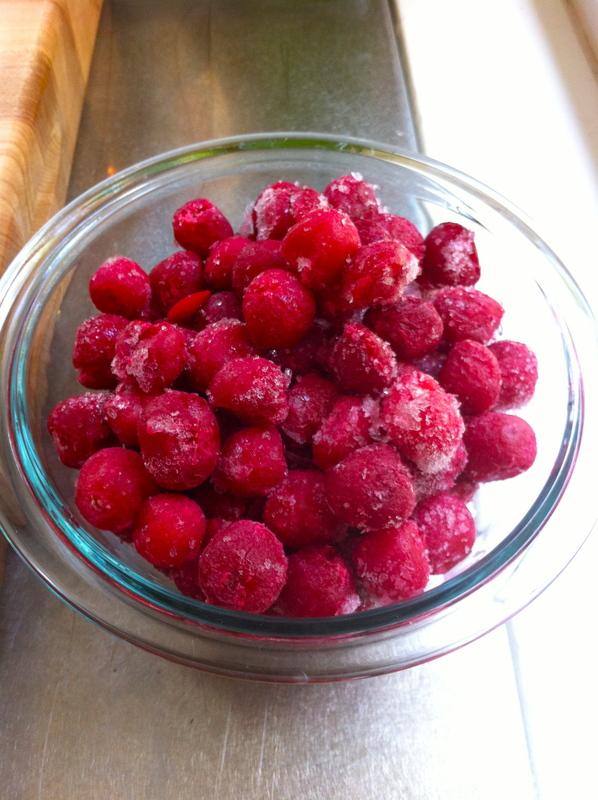 In the back of the freezer I found one bag of tart cherries, just what I needed to compliment the rhubarb. I was going to make my own fruit leather. I absolutely love America’s Test Kitchen and everything related to it. I love the magazines, the cook books, the shows on public television – all of it. I love that novice or expert chefs alike can try something new, knowing it has been tested and retested until it is “perfect.” However, I also love that I can still alter or change the recipes to make them my own. 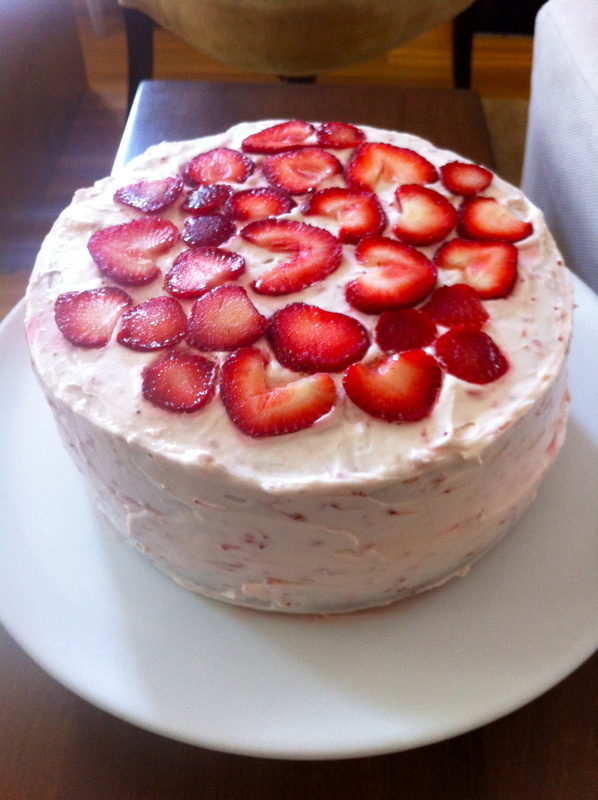 In my opinion, this strawberry cake was almost perfect. The problem arose in the frosting department, but we’ll get to that later. But before that, I’ll tell you what I loved about this cake. First of all, it was beautiful to look at. But this cake wasn’t just all beauty and no substance, nosiree. This cake was a genius on the inside. The cake itself was light and airy, with a faint pinkish color to indicate that it was, in fact, made from strawberries. Tucked inside were fresh sliced strawberries to add a pop of freshness and bright color when served and eaten. Just look at those two. Look at them. 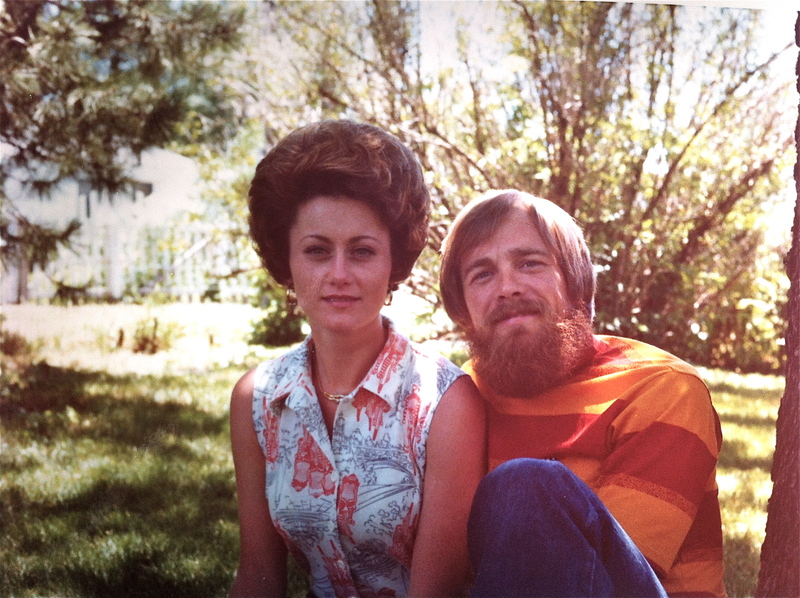 Those are my parents, Jim and Vivian, in June of 1976. I haven’t confirmed this, but my guess is that this photo was taken on or around my mother’s birthday. At the time of this photo, my parents had only been married just under 3 years. They still have newlywed glow surrounding them. They are both simply perfect, aren’t they? Well, aren’t they?? I decided to include this amazing photo of my parents because this post has a lot to do with my dad and my childhood. Growing up, I would help my dad in the garden each year. I would hold the tiny beans in my tiny hand as my father made an indentation in the dirt with his index finger. I would plop them in, one by one, and pat them down gently with my palm. I would loosen the roots of the tomato plants as my dad dug holes for them. I would help spread grass all over the garden, making sure not to miss a spot. When it was time, my dad would send me out to “harvest” what was ready. One of my earliest memories is of picking cucumbers in order for my dad to make quart upon quart of dill pickles. I can virtually guarantee that my love of all things vinegar started then and there, right in our kitchen. He’d send me to the garden with a bucket and I’d tiptoe through the cucumber plants, lifting up their scratchy leaves, and hunt for the perfect batch. If you’ve been reading this blog at all, you know that I like to bake. I love to cook just as much, but when the weekend arrives, I like to pay special attention to baking. This last weekend was no exception, especially since I found some lovely raspberries at the farmers market on Sunday. I visited the farmers market alone this weekend. Normally, Scott and I divide and conquer, but he had some paintings to finish, so I set out with my canvas bags and cash in hand. I took a little longer wandering around, smelling the produce, checking out the various dogs and their owners, and lingering around the Cajun band playing between vendor booths. The weather was absolutely gorgeous (we’ve been experiencing 100 + degree days for far too long) so I was in no rush to get back into air conditioning. I knew I’d be baking this cake later on, so as I walked around I kept my eye out for fresh berries of some sort. I spied the ruby-red raspberries from quite a distance, and I headed straight for them. The price was a little steep for just a pint, but I knew that farm fresh berries far surpassed the sad, packaged-in-plastic berries I see in the grocery store. With a quick exchange of cash, they were mine. Under normal circumstances I wouldn’t use this forum to air my grievances or share sad stories, but in this case, I feel like I have to. I’ve been absent from writing and here is why: we lost a member of our family this week. Our dear cat, Arthur, gave up the ghost on Tuesday morning while lying on my lap. Roughly six weeks ago he was diagnosed with Lymphosarcoma, and the vet gave him maybe six months. Unfortunately, he didn’t make it. However, I know that he was loved intensely for his six short years, and he died on one of his favorite places. These animals that spend every day with us…sometimes they blend in when we’re busy, and sometimes they push their way in right when we need it. But when they’re gone, their absence is deeply tangible. So, forgive me for my negligence. As it happens, when I find myself in a blue state of mind, I like to cook. I feel that cooking gets me out of whatever funk I might be in, as it forces me to pay attention, follow a method, and it forces me to redirect my energy. All good things. The result this time? 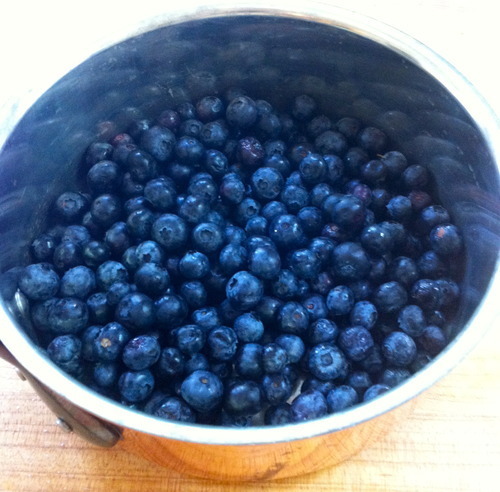 Blueberry pie, naturally.